Wooden 123 & ABC Fridge Magnets from 99¢ w/ FREE Shipping! are only 99¢ and ships FREE! that are only $2.34 with FREE shipping! 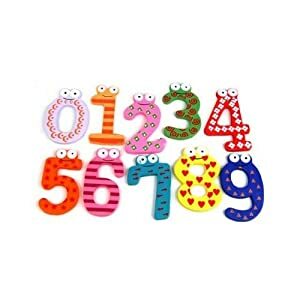 These are extremely fun for toddlers and kids of all ages to enjoy letters and numbers on the fridge or any other metal surface that will accept a magnet! Add to play time by giving your child a set of these magnets and a cookie sheet to sit in the floor and have some fun! These are complete with fun eyes and bright colors! Order both sets and store them in an empty baby wipe container or oatmeal tube for easy access! These make wonderful stocking stuffers and perfect gifts! Order your set of Wooden 123 & ABC Fridge Magnets are perfect for toddler playtime. Use these on the fridge or stick them to a cookie sheet for floor playtime! NOTICE: Amazon prices are subject to change at any time. We cannot guarantee that this price will be the same price when you attempt to order this item. It is highly recommended that you confirm the price in your cart BEFORE you submit your order. Check out our other Amazon Deals!